7.00am - Women on the Line: Artist Larissa MacFarlane joins Women on the Line to talk about disability and art practice, disability pride as practice and the hidden joys of handstanding and grandstanding for healing. Listen Now. 7.30am - The Gardening Show will be focusing on gardening and horticultural activities for people with disabilities. Guests will include: Steven Wells, a horticultural therapist, nurse, and gardens & grounds project officer with Austin Health; Basil Natoli, a garden teacher working with children with disabilities at three Education Department run schools in Melbourne; a horticultural consultant from Humanscapes / Kevin Heinze Grow - a small team specialising in creating therapeutic environments and assisting clients with the design and development of horticutural-based therapy programs. Listen Now. 9.15am – Alternative News: Presented by the Campaign for International Cooperation and Disarmament. Disabled people directly affected by war can have great difficulty escaping during attacks, especially those with a moving, learning, or visual difficulty. The victims of modern wars are more than ever civilians rather than soldiers. The legacy of war on the civilians and the fighters is not only death and destruction, but the significant number of injured which lead in many cases to disability. This adds a significant unseen and underestimated disadvantage to the efforts to rebuild a life and civil society in the face of devastated infrastructure, society and social cohesion. Listen Now. 9.30am – Health, disability care and neo-liberal reform. Disability care, like health generally, is fast becoming yet another commodity with the rollout of the National Disability Insurance Scheme. The implications for the sector and its workers are far-reaching. Annie McLoughlin brings us recordings from the Union Activism and History Conference 2017. Listen Now. 10.00am – Invisible Disability: Marijo and Maryse introduce their new program. Chronically Chilled, starting December 6th at 6pm, is a monthly show that aims to provide a platform to those living with chronic and invisible illness as well as exploring topics that impact upon their daily lives. Listen Now. 10.30am - Latin American Update will explore aspects of life for people with disability in Latin America. Listen Now. 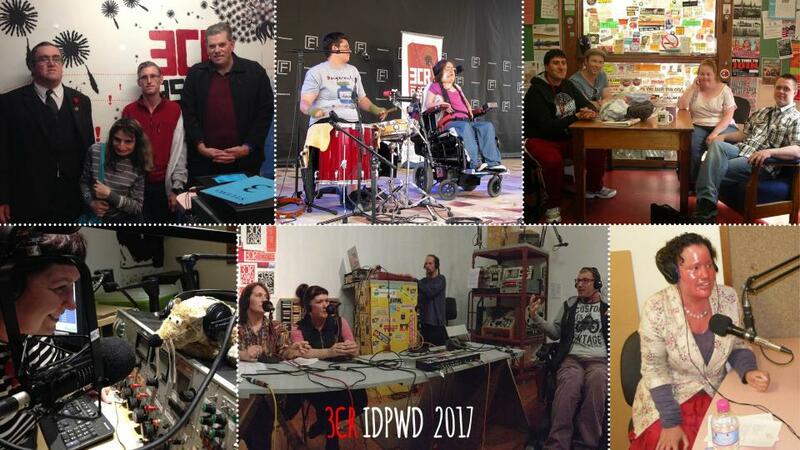 11.00am - Earth Matters: Kerri-Lee Harding brings you ‘Disability Rap’ – a radio show presented by FREED - a disability and aging resource center in California. This edition explores the intersection of disability, climate change and natural disaster. Listen Now. 11.30am - Phin Meere (The Boldness) will discuss Voluntary Assisted Dying and what it means for People with Disability. Listen Now. 12.00pm – Out of the Pan: At the diversity intersection: queer and disability. What’s it like to be anywhere in the intersections of queer and disability (or being perceived as experiencing disability)? A range of people share parts of their stories, the ups, downs and in-between. Listen Now. 1.00pm - Marisa Sposaro (Doin’ Time) will broadcast on the empowering topic of the lived experience of blindness and vision impairment, which can never be taken away. She will concentrate on the areas of life that blind and vision impaired people wish to speak about on the day, including a historical focus of what it was like for older blind people, before technology. Listen Now. 2.00pm – Enpsychedelia Enpsychedelia's disability day special broadcast will explore the often hidden implications of living with Chronic Fatigue with guest Kate Pern. We'll also be exploring disability and the party scene, working toward making partying accessible to all people through accessible venues, knowledgeable staff and an attitude of care and compassion. The show is dedicated to Max Luca-Reddaway, 26/11/88 - 23/07/15. Listen Now. 3.00pm – Queer Focus: Featuring guests Kirrily and Ross DeVent. Listen Now. 4.00pm - A Rambling Beurologist’s Dream: Expression through Art. Art is an important aspect of many people with disabilities lives. It’s where they can express themselves and share their stories with others. Host Raphael Kaleb (The Boldness) interviews: Larissa MacFarlane – a disability artist whose 2017 exhibitions include Grandstanding not Handstanding, In Sickness and Stealth, Invisible and Disability Pride; Sarah Barton – producer and Director of global disability documentary sensation “Defiant Lives” –the story of the pioneers of the world disability movement; Heidi Everett – Chairperson of Mojo Film Festival and mental health recovery advocate and Alistair Baldwin – Victorian State Finalist National RAW Comedy with a physical disability. Listen Now. 5.00pm – Are You Looking at Me? with Liz Wright. 6.00pm – Music You Can Feel: Ralph Knight (Steam Radio / Swing and Sway) brings you an hour of music featuring disabled artists: Connie Boswell who was a paraplegic since early childhood and made her fame through the 20’s-40’s in music and film; Alex Templeton a blind musician and composer in comedic and classical styles and Banjo Player Blind Willie. On Sunday 3 December 3CR celebrates Disability Day with 12 hours of dedicated programming from 7am to 7pm. On Saturday 3 December 3CR celebrates Disability Day with 12 hours of dedicated programming from 7am to 7pm. Join 3CR for 12 hours of disability pride and activism on Thursday 3 December 2015, International Day of People with Disability.